A terrified 31-year-old Mark Collier suddenly becomes aware that he is making a life for himself in the Charlotte metro area. CHARLOTTE, NC—Suddenly stopping in his tracks as he boarded the Lynx blue line to go apply for a library card on Tuesday, local man Mark Collier came to the horrifying realization that he was putting down roots in the city of Charlotte, NC. 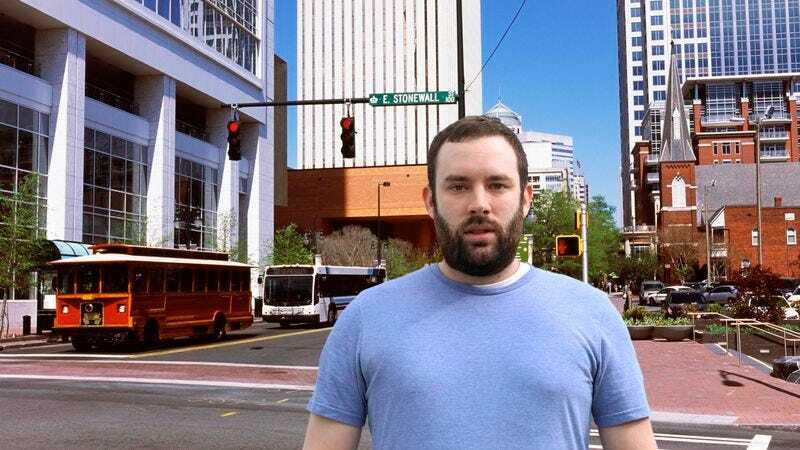 Collier, 31, who moved to Charlotte two years ago to take a job at a digital marketing agency, told reporters it just became terrifyingly apparent to him that, if asked, he could now easily give strangers accurate driving directions in or around the Charlotte metro area or offer recommendations on the Queen City’s bars, shopping malls, art galleries, public parks, or concert venues. As it suddenly became clear that the majority of his wardrobe had been purchased at the South End Super Flea, a disturbed Collier realized that he could also consider himself a “regular” at not one, but three Sizzlin’ Saturday food carts, each of which know his name and preferred order. In addition, it hit Collier that he actually has strong, informed opinions about the job Patrick Cannon has been doing as mayor so far. According to Collier, putting down roots in Charlotte “just kind of snuck up on [him].” What started with minor occurrences such as having to change his default mailing address on Amazon quickly grew into something much more involved as he was summoned for jury duty at the Mecklenburg County Courthouse and started considering U.S. Airways his “preferred airline” because it had a hub at CLT. Earlier this fall, he even attended a Charlotte Bobcats game and heard himself say the words “let’s go ’Cats!” while clapping.